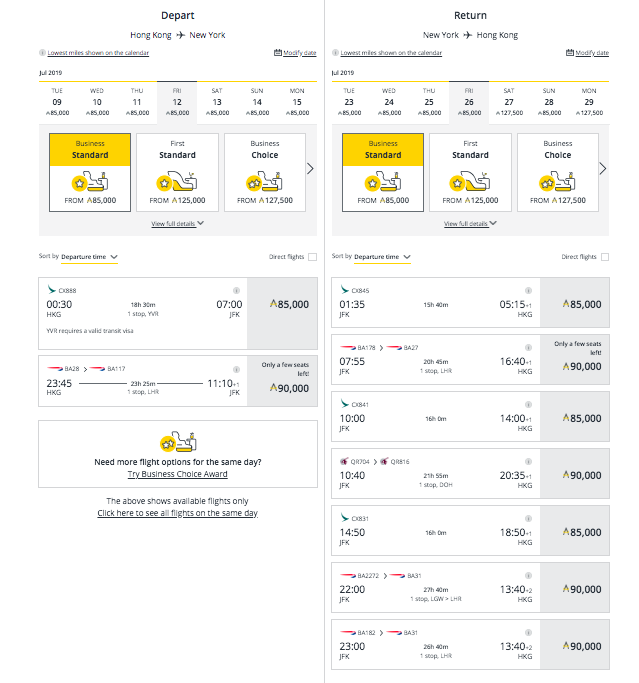 Historically, access to Cathay Pacific awards was extremely generous, however, since changes made to the Asia Miles program in June 2018, availability of their cheapest Saver awards has tightened on many routes, likely due to the introduction of the third type of award fare, where previously there was just two. A test: what has happened to award availability? For New Zealand, your chances of grabbing a reward seat increased at around the three-month mark, but only ex-Auckland. In Australia, your chances increased the closer out from departure you booked. One redemption flight was available for booking within one week of departure from Auckland. Christchurch wasn’t available because they’re summer seasonal only. All Australian airports had at least one flight available, with the exception of Brisbane and Cairns to Hong Kong in both directions and Adelaide to Hong Kong. Redemptions three months out was the sweet spot for ex-Auckland – at least eight days were found in October with good award availability. However no flights could be found on the return. For Australia, it was the other way around – only the return leg from Hong Kong to Australia showing availability—at least one flight was available for redemption to Sydney, Melbourne, Perth and Adelaide. Again, Brisbane and Cairns had no availability, along with all routes to Hong Kong. 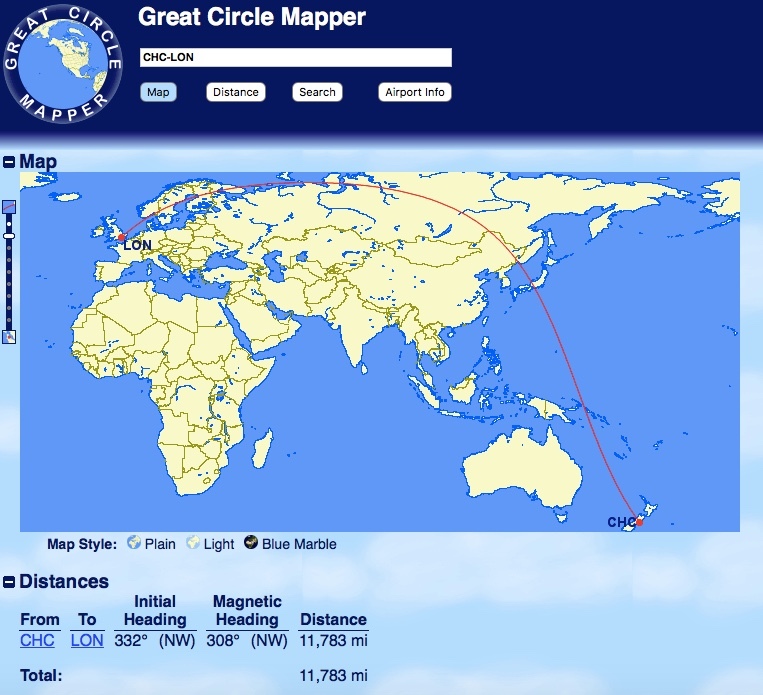 It was near impossible to find an award seat when the calendar opened, which is 353 days out for a Saver award type, with no flights available for any NZ/AU – Hong Kong route—the Asia Miles site defaults automatically to the more expensive Choice or Tailored fare types for these searches. Award availability for routes beyond Hong Kong was a mixed bag, with more flights being available within one week of departure and at 353 days out than at three months out. Within a week of departure, there was at least one award flight available in Business Class from Hong Kong to New York JFK and back. There was also plenty of availability from Hong Kong to London Heathrow and Chicago to Hong Kong. All other routes did not have Business flights available. 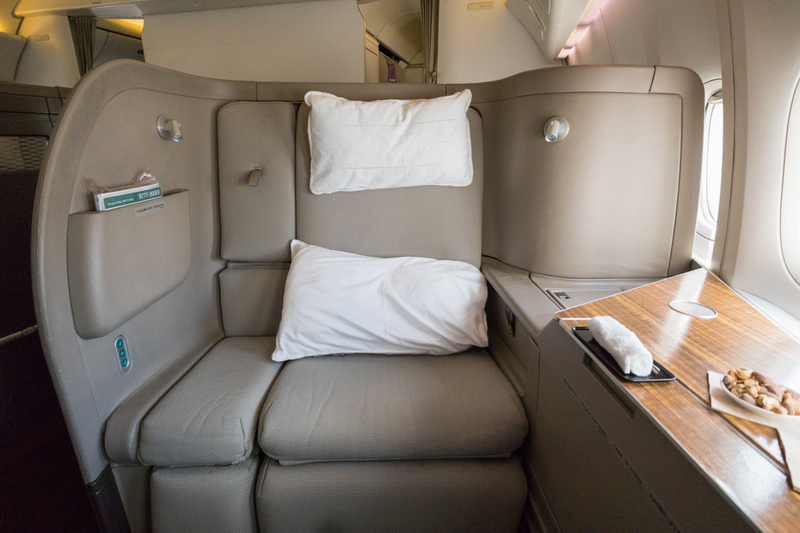 For First Class awards, only London Heathrow, Los Angeles and New York JFK to Hong Kong, as well as Hong Kong to Chicago had a First Class award flight available for booking. However, First Class availability was actually very good a year out, with all routes in both directions having at least one flight available and, in some cases such as Los Angeles and New York JFK to Hong Kong having at least three flights available in both directions. It was a different story when trying to book a Business seat three months out, with only Hong Kong to New York JFK having just a single flight available. All other routes showed no availability. First Class flights were also limited, with only one flight available in both directions from Hong Kong to New York JFK. 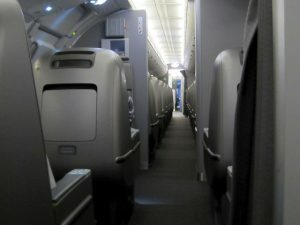 In general, Business Class flights were not difficult to find, with plenty of flights available at each timeframe, and, in many cases, the number of flights available was in double digits. 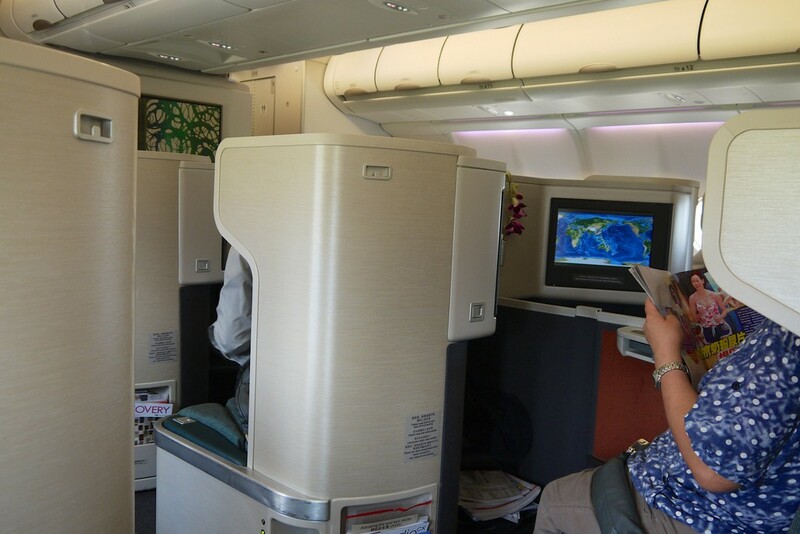 First Class award availability, on the other hand, was extremely difficult to find, with only Singapore – Hong Kong at one week out showing availability—no other routes or timeframes had flights available. 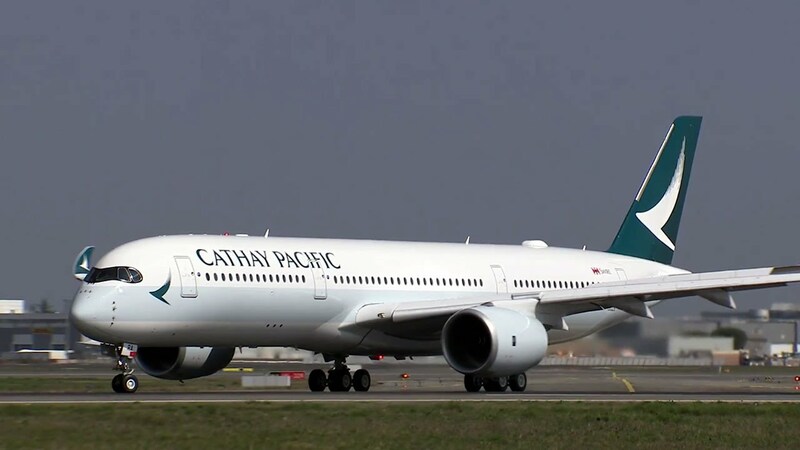 Hong Kong-based oneworld alliance member Cathay Pacific is a favourite carrier of ours here at Point Hacks, offering one of the most superior and consistent First and Business Class experiences of any premium carrier in the world. The airline offers flights between Auckland and Hong Kong on their modern A350 aircraft (including seasonal flights from Christchurch), comfortable lie-flat Business Class seats, and generous award availability onto a wide network of destinations. In this guide, we explore Cathay Pacific’s routes, aircraft and premium cabin products, teach you how to calculate how many points you need for your next trip on the airline, analyse which frequent flyer programs offer the best value, advise how and when to book an award seat, and provide links to Point Hacks reviews of Cathay Pacific flights. Its low-cost subsidiary Cathay Dragon destinations operates exclusively within Asia, you can see all destinations here. 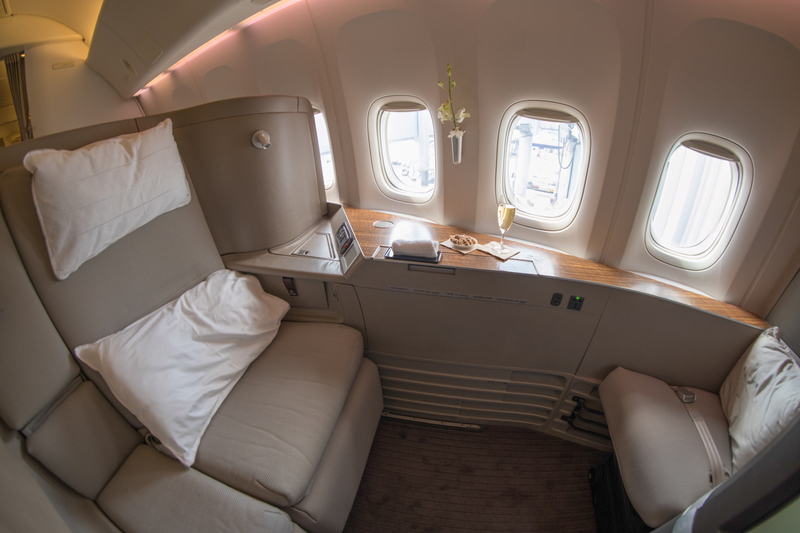 This cabin is flown exclusively by the Boeing 777-300ER mostly on long-haul flights with six open suites in a 1-1-1 configuration. It is renowned for its wide seat and excellent lounge access options. 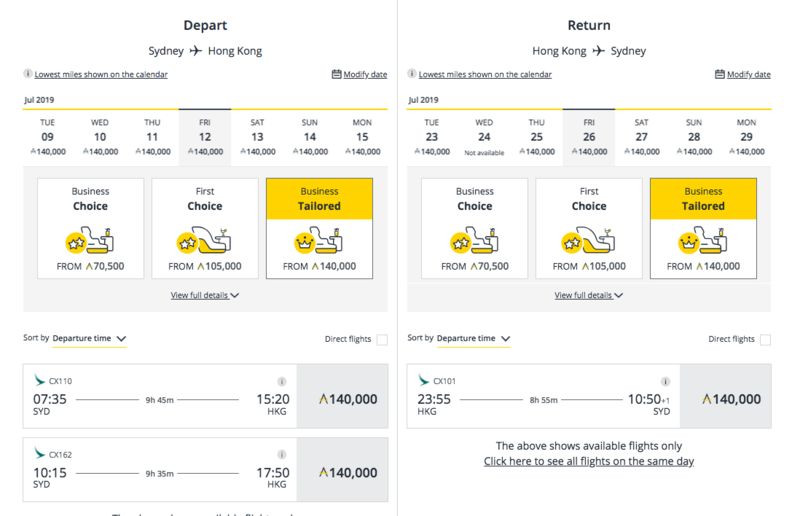 One of the cheapest redemptions is Hong Kong to Taipei in First Class for only 26,000 Qantas Points (one of the best uses of Qantas Points in our opinion). 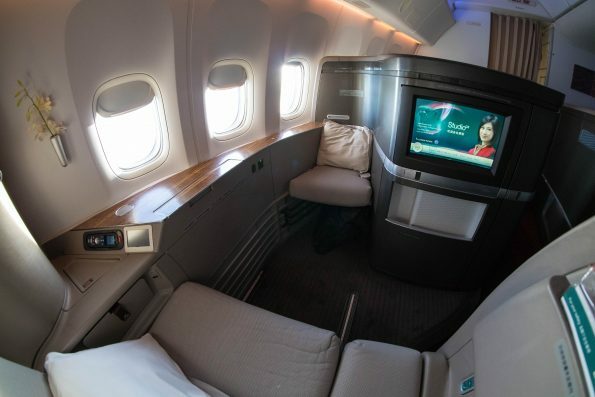 The majority of Cathay’s medium- and long-haul routes are serviced by a combination of Boeing 777-300ER and Airbus A330 and A350 aircraft, featuring lie-flat Business Class seats in a 1-2-1 configuration. There is an exception to this – regional routes serviced by some Airbus A330 and Boeing 777-200 and -300 aicraft have angled seats in a 2-2-2 or 2-3-2 layout. Try to avoid this aircraft if you can. The most modern aircraft in the fleet, the A350, is gradually replacing the older A330s, and thankfully for those of us in New Zealand, now flies to Auckland and Christchurch. Premium Economy can be found mostly on medium- and long-haul routes in a 2-3-2 or 2-4-2 configuration. To understand why we focus on premium cabin redemptions rather than Economy Class ones, check out our guide to maximising value from points. Say you want to book an award flight from Christchurch to London. Step 2: Depending on which points currency/ies you have access to, go to the distance-based Asia Miles or Qantas Frequent Flyer award chart to determine the points cost of your redemption relative to the distance, cabin and one-way/return trip. AAdvantage and Alaska Airlines Mileage Plan have region-based award charts, so you don’t need the exact distance for those ones. When clicking through to the Asia Miles award chart, I can see my 11,783-mile trip to London would cost 85,000 one-way/170,000 return in Business Class. If you are an Asia Miles member, go to the Asia Miles online booking tool, enter the flight details and if there are open seats, you will see the taxes displayed on the results page. If you are using another frequent flyer program like Qantas or AAdvantage, the taxes will show on the results page there (again, as long as there is award availability). If there is no award availability, you might consider using the more advanced ITA Matrix method. See our guide to searching for award space most efficiently. When does award calendar availability open up? Cathay will release award seats to its own Asia Miles members 360 days before departure for it Choice and Tailored awards, and 353 days before departure for its Saver awards. British Airways and Qantas get next dibs at 355 and 353 days, respectively. And then AAdvantage and Mileage Plan members can access Cathay award seats 331 days before the flight. 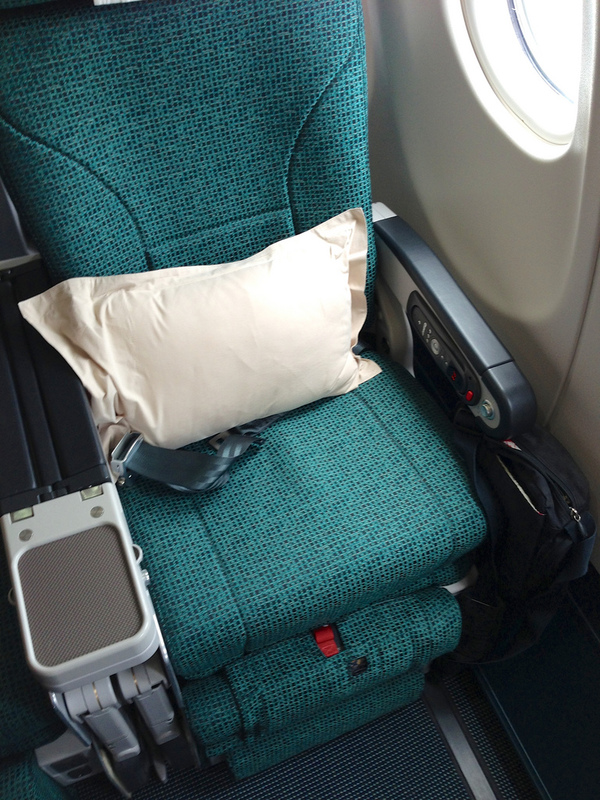 Cathay will also then release most unsold First Class seats 24-48 hours before departure. 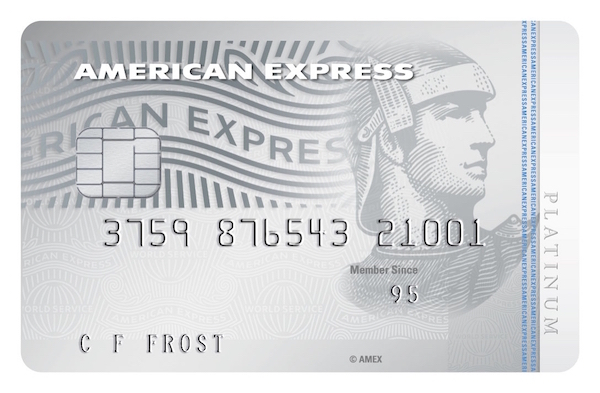 If you’ve got access to Asia Miles, Qantas Points, AAdvantage or Mileage Plan miles, then a Business or First Class redemption on Cathay Pacific will most likely get you good value out of your points, as well as a professional and comfortable experience both on the ground and in the air. Do try to line up your flights so they provide you with a modern aircraft and product, and take advantage of free stopovers with Asia Miles, Avios and Mileage Plan redemptions. Supplementary images courtesy Cathay Pacific.